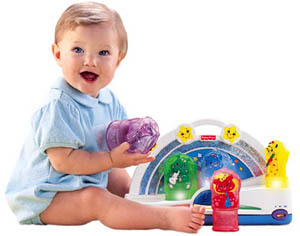 This musical toy, from the Fisher-Price Sparkling Symphony collection, makes almost any parent feel as if there is a little prodigy in the house. The collection of five colorful creatures, each playing an instrument, is so bright and engaging even you won't be able to keep your hands off it. With the flip of the on-off switch (which has two volume levels--hurrah. ), you are treated to the soothing, classical masterpieces of Beethoven, Mozart, and others. The fun and learning come into play when your child picks up each of the animals and the song changes a bit. Your child actually controls the melody by adding or taking away the various members of this five-piece symphony. The bright green hippo can do a solo, but the song sounds much differently than when he plays with giraffe, elephant, or the whole crew. There are three nodes of play--voice, instrument, or both--and baby can switch among them by pressing one of the three big buttons on the front piece. The animals themselves are large, easy-to-grasp pieces that almost beg for you to pick them up and begin. The flashing lights beneath each animal add an element of surprise for growing babies. Starting with five basic classical works, babies can remove or add orchestra members to change the music and create new masterpieces. Each animal plays a different instrument, with over 100 musical combinations to mix and match. Three settings are available--instruments, voices, or a combination of both. The entire orchestra can play together, individually, or in various combos. Switch to the voice setting to hear the band members sing in different pitches. High-quality orchestral sound, dancing lights, and size-sorting fun, too.